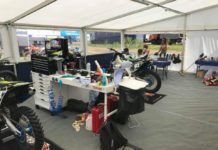 Home Interviews Interview: Duns MX2 winner Mel Pocock – this was like Romaniacs! Interview: Duns MX2 winner Mel Pocock – this was like Romaniacs! Mel Pocock is having a great season in 2018. The Englishman took his first British championship win of the season in very, very tough conditions at Duns, making the pass on his teammate Martin Barr on the last lap of race two to clinch the victory with a 4-3 score. Pocock is really coming back to the form he showed before he lost his thumb a couple of years ago and with wins and performances like this, the Revo Husqvarna rider is only going to get even more confident. We spoke with Pocock after the podium celebrations to his take on the win and his views on the EMX2 title chase that he is very much involved in, a championship that appears will go down to the wire. A messy day but it was worth it for you with a win today! Fair play to Martin, we were joint on points but the way they score it (second moto tie-break) it gave me the win. It’s my first win in a long time, in actual fact years, I am proud, really proud about that. The first race was really hard work for me, I went down in the first corner and came all the way back to fourth which was one of my better rides that I have done for a long time. I tried really hard because I knew the rain was coming in and if they were to cancel it I needed to get top three in the first race. The second race was – I think you could have made it around 95% of the track on a jet ski it was that wet! It was horrendous, for eye sight and how technical it was out there to control the bike, it was really hard. I crashed five times, went off the track once. I banged elbow pretty hard actually in one of them. Again thanks to Sam and Mark Yates, Joe, Jacob, everyone that has worked hard today in this rain, it’s going to be a big, long clear up but the bikes were faultless I got my first win in Scotland so happy days! Next weekend it’s back to the EMX2 championship in Lommel, you are second in the championship behind Boisrame, right in the championship hunt and coming in with some good momentum now. I wouldn’t call this quality training for Lommel – this was like Romaniacs I think! I have some work to do in the Europeans, I really want to get that championship win, it’s coming to the end of the season and there are four rounds left. I am going to pull all the stops out to get that championship win.